There are so many varieties of chili out there, but this creamy white chicken chili will soon be your favorite! Just dump everything in your slow cooker and let it do the hard work for you! We have officially entered chili season!! Until now, our hands-down favorite has always been my healthier turkey chili. While it still holds a special place at our dinner table, this creamy white chicken chili has taken the top spot. It’s so deliciously savory with just the right amount of spice! Plus, it’s almost effortless since it cooks in your slow cooker! Slow cooker soups are truly amazing, like my slow cooker creamy tomato soup or zuppa toscana. I’m all about that great homemade flavor without all the effort! The inspiration came from a combination of a previous recipe of mine, and this recipe from The Cookie Rookie. Her website is amazing! Originally I had planned to make this a stovetop soup, but I had this brand new slow cooker from my brother (birthday present), so I figured I’d convert it! I won’t claim that this creamy white chicken chili is healthy… but I do think it’s a little healthier. My old recipe for white chicken chili used all heavy cream to make it smooth and creamy, but this one uses reduced fat cream cheese and a splash of half and half! I also like to forgo the shredded cheese on top and go for a small dollop of sour cream (I gotta have it! ), a few jalapeno slices, some slices of healthy avocado, and some lightly salted tortilla strips. Tons of great flavor, with a little less calories. 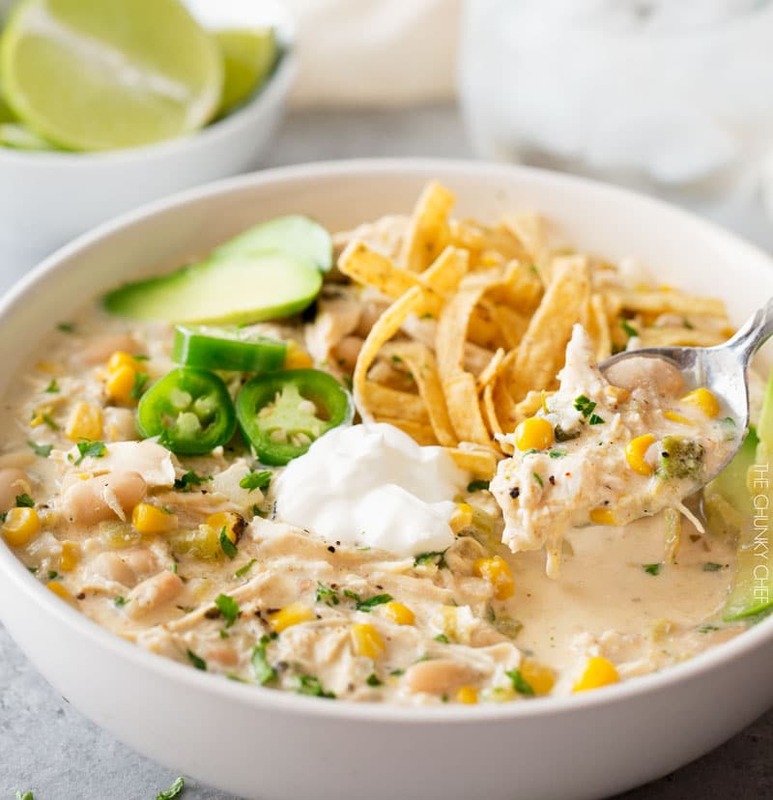 A lot of creamy white chicken chili recipes don’t have corn in them, but I added some here because the subtle sweetness goes really well with the heat level from the green chiles. While this chili is perfect for those chilly Fall nights, where you can curl up on the couch with a big bowl and switch on the tv, it’s also really great for game day! You can feed quite a few people with this chili (especially if you have a big slow cooker like this one, and you can double the recipe), and even pick up a carrying case so you could take this chili tailgating! 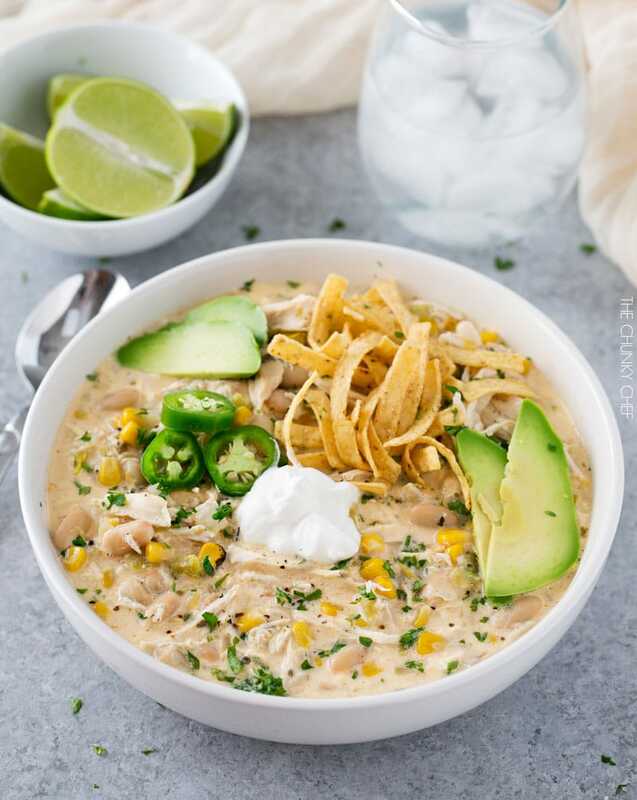 I’ve even seen some people having a chili bar at a party, where you whip up a big batch of this creamy white chicken chili, then set out a big variety of toppings and let your guests make it their own. This is one meal you definitely need to try this Fall or Winter… trust me, you deserve it! Try a big slice of this skillet cornbread alongside this chili… you’ll love it!! PROGRAMMABLE SLOW COOKER – This is the one I have, and I really love it! It won’t break the budget, but works really well. 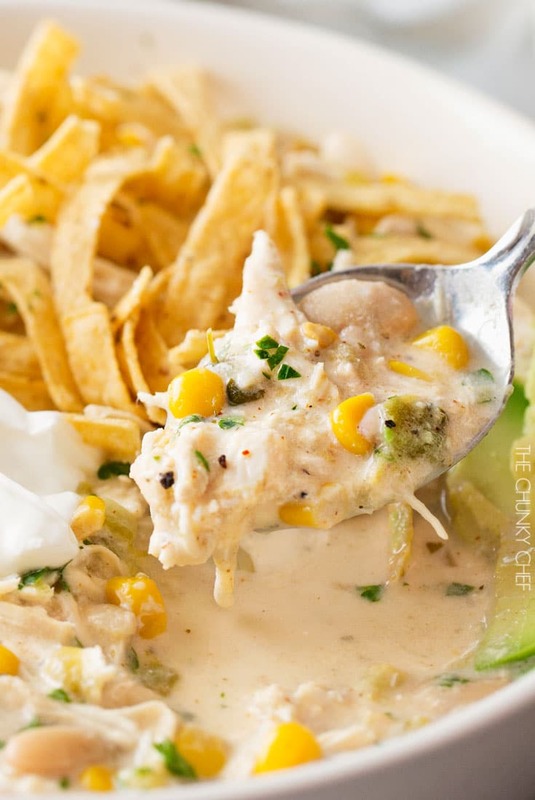 This creamy white chicken chili is made super easy in your crockpot! Creamy with plenty of spice, it's the perfect companion on a chilly night! Made this for my tabletop game group tonight and we all loved it! I half-doubled the recipe (150%) and I’m glad I did, because even though the crock pot was full to the brim the seven of us almost finished it off. Goes great with cornbread, tortilla chips or Fritos. I also like my chili thicker so I added a bit of cornstarch slurry and it was perfect! Super easy and DELICIOUS! I have a larger slow cooker so I made a double batch. Only tweaks I made were substituting 1 can of diced tomatoes with jalapenos in place of 1 of the 2 cans of corn and 1 can of kidney & chili hot beans in place of 2 of the 4 cans of great northern beans. We don’t make anything without spice so I also added a can of diced jalapenos. This is delicious and super easy to make! Thankfully I read through the other posts cause I was trying to figure out where I went wrong as it was pretty soupy. It’s supposed to be😃. The flavors are omg good, instead of regular chili powder I used chipotle chili powder but that is my preference. Will definitely be making this again. AMAZING RECIPE!!! So much flavor & plenty of food! We always make it, freeze half & reheat it on the stove! Awesome recipe! Thanks for putting it out there! Thanks for sharing! I made this for my office chili cook off and got first! I did a double. I cooked on low for 10-11 hours, doubled the ingredients but only used 32 oz of broth. I threw in one jalapeno for the heck of it but it’s hard to say if it did anything. Tasted amazing! Just to be sure — you add uncooked chicken to the Crock-Pot? Yes, it cooks through in the crockpot. Maybe entire family loved this! Including a semi-picky 11 year old. I will definitely Ben making this again! Easy and delicious! Made this tonight! Very good! Is it supposed to be soup-y? I didn’t add the cream but rather the whole 8oz of cream cheese. I also added some flour and corn starch bc it was so liquidy. Not sure if it was supposed to be like that or not but, all in all, it was fabulous! Thank you! Yes, traditionally white chicken chili is thinner than a regular chili would be. Glad you enjoyed it! I made this last week and it was DEEEEELISH, just trying to figure out how our calorie count is so different??? I made this a couple times,tweaked a little. I won a chili contest, hands down! Can you use dry bras instead of can? I haven’t tested the recipe using dried beans, but if you try it, make sure you soak them until they’re soft. How spicy is this?? I’m making it now and I’m getting nervous that it may be too spicy! I used the mild chilies. Due to some allergies I’m catering to, I cannot include the green chillies or jalapenos. I was thinking about adding potatoes to add in some more textures but do you have any suggestions to add for flavor since I’ll be leaving out those ingredients? So I actually just upped the black pepper to 1 tsp to give it at least a little bite, and then I added the diced potatoes for extra texture, and this chili was amazing. I was really afraid that it would be lacking because of the lack of chiles but it was so wonderful. My boyfriend actually ate the entire crockpot except for like a serving or two. He loved it and I made it again for an event the next day and he ate a lot of that too! This is an awesome recipe that’s been a huge hit every time I’ve made it. In fact, it’s so good that I seldom ever make my traditional chili recipe anymore! Thanks so much to Amanda for sharing it! What am I doing that my cream cheese stay chuncky. My kids thought I put cottage cheese in the chili! Having the cream cheese at room temperature should help with that problem. I’ve never made chili before – we had a chili cook off at work, and I won first place with this recipe! I doubled the spices for a little more flavor, and cooked in some shredded cheese with the cream cheese and half and half. Any changes to the recipe if I used chicken tenderloins? I have made this several times and each time it gets better. My husband LOVES it. Super easy and incredibly tasty. Thanks! Just made this (minus oregano) and it’s amazing! I haven’t tested it personally, but I know a few readers have tried it. This is SUPER Delicious!!!! I’ve made this several times since finding the recipe!! Thank you so much for this Gem!!! How would I follow recipe for instant pot? I haven’t tested it myself, but several other readers have commented with how they did it. I am making this now but had to double the recipe (big family) if I cook it on high how long should I cook for? I would add 30 minutes to 1 hour to the cook time. What is the serving size? Wondering how many servings an 8 quart will make? Approximately 1 – 1 1/2 cups per serving. I’m making this right now and it smells amazing! I think I’ll use masa flour to thicken it up a bit. Made this for kids and adults and was loved by all. The recipe ended up a little bit runny, although that may simply be a preference thing. I blended an extra can of beans and added to the pot, then ended up discarding some of the liquid. Regardless…totally delicious. Loved the corn and creamy additions! Definitely adding to my list of chili recipes to use again. Think I added too much broth…how can I thicken it up? You can add a small amount of cornstarch to a little water, stir until it dissolves, then pour that in the crockpot. Stir well and cook about 15 minutes, uncovered. Could this be made in an instant pot? If so, how long would you recommend? Thinking about making this with chorizo in addition to the chicken. Should I cook the chorizo separate and add it, or would it cook okay in the crock pot? I decided I felt like having a white chicken chili for Super Bowl Sunday. I decided on this recipe and it is a WINNER. Absolutely DELICIOUS! I did mine on the stovetop because I found the recipe a few hours before dinnertime…turned out just fine…I simmered it for a while after shredding the chicken. I highly recommend! I am making for first time, used chicken breast on the bone & frozen sweet corn, most likely will take longer to cook. Will see how it turns out. Any suggestions on how to give this recipe a little kick in spicines? I used one can of diced chilies and some canned chopped jalapeños. It was pretty spicy! I’m unclear as to how much chicken broth you use. The recipe says 24oz., but in the review/comments, I saw one that says nothing about doubling the recipe but using 48OZ. OF BROTH. The comment you’re referring to did mention that they doubled the recipe, except instead of doubling the 24 oz to be 48 oz, they used 32 oz. So for a single batch of this recipe, use the amount listed in the recipe, 24 oz. 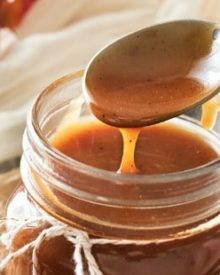 can I “double” this recipe in a 6 quart slow cooker?? I wouldn’t advise it, as it would be way too full. I would say 8 quart to double this recipe, or two crockpots side by side. If you double the recipe in an 8 quart slow cooker, would you have to adjust the cook time at all? I’ve only ever done the single, but I need to make a bunch and want to avoid having 5 slow cookers out. Thoughts? I think the cook time would remain the same, but haven’t tested it to be certain. Made this soup a couple of weeks ago. Family loved it! Will make it again. Will double it to make more servings as well. Great w/o corn. Wonderful to come home from work and dinner almost complete. Thanks! We really liked this! After I started making it I realized I didn’t have cream chees, so I used a little more milk and shredded some Monterey Jack cheese. Worked fine. We’ll make it again, I’m sure! Made this twice in 2 weeks… JUST CAN’T GET ENOUGH. Tweaked a few things to spice it up and just love it…& I’m not really a chili guy. THANKS CHEF! What step should I add cornstarch to make it thicker? I would dissolve the cornstarch in the half and half before adding it. When this says 6 servings, is it really 6? I am trying to decide if I need to double or triple the recipe for a work event. I’ve served 6 people with this recipe. What would the serving size be for one person, about a cup? I haven’t measured it exactly, but between a cup – cup and a half. Hello! I want to make this tonight so I won’t have time for crockpot. How would you suggest I cook using raw chicken breasts? Add all ingredients up to cream cheese and half and half to a large stockpot or whatever you usually cook soup in. Stir well and bring to a boil, then reduce heat to a simmer. Partially cover the pan with the lid and simmer for about 30-40 minutes, or until the chili is thickened to your liking and chicken is cooked through. Remove chicken and shred, then return to the pot. Add in half and half and cream cheese, stir well and let simmer a few minutes. Stir, then serve as per the recipe. I just had another reader comment that she didn’t have good luck with using dried beans, so I’m not entirely sure. I haven’t tested the recipe using anything other than the ingredients listed. I would say you could use them, but you’d want to soak them until they’re soft already before making the chili. This is really full of flavor and a great recipe! I made the mistake of using dry beans! I soaked them overnight and have been cooking them in the crock for almost 7 hrs on high and they still aren’t soft. Not sure why this happened! I’ll def use canned next time. This is the best tasting white chicken chili I’ve had yet! My family loved it. thank you! What is 1/4 cup half and half please?? Half and half is a dairy product that is part heavy cream and part milk. It’s located in the dairy aisle of US grocery stores. I haven’t tested it, but I’m sure that would be just fine. What about adding additional vegetables such as carrots and broccoli? You can absolutely do that if you want. Tried this as stove pot and it was absolutely the best we’ve (5 of us) have ever had! Didn’t change a thing! What adjustments would I make if using already cooked chicken? You wouldn’t need it to cook as long, I’d say 3-4 hours on low. This recipe is so darn delicious ! I’ve never had white chicken chili before, but my husband begged me to make it because his coworker said that white chicken chili is so good. Well, I looked for a recipe to make in the crockpot and yours looked so good, I had to try it. Let me tell you that this was so tasty that I believe that this has got to be the best one on Pinterest. I’m not even trying any other recipe. I follow the recipe exactly except for cilantro. Yuck, I hate cilantro. Thank you so much for the recipe. I’ve made this 4 times already and plan on a whole lot more. We crave it and wonderful on a cold winters day. We fixed this for last night, stuclk straight to the receipe except we did stove top and thst is the best chilli we habe aten! This will be on my menu quiet often! Thanl you so much for posting. Made a few adjustments because of what I had on hand – can of creamed corn instead of kernels, cream cheese with chives instead of plain, unsweetened dairy free creamer instead of half and half. Reduced broth by about 4-6 oz per others. Served with sour cream, shredded cheddar and crushed tortilla chips. Perfect on a cold winter day! Leftovers turned into chicken chili nachos the next day with melted cheese on top. Def putting on rotation! This is, by far, my favorite White Chicken Chili recipe! 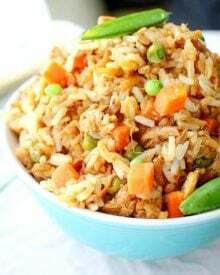 It’s delicious, easy, and a favorite with my family! Thanks so much for this recipe! Made this tonight. It was delicious! A definite keeper. Made this tonight for my roommates and I for the snow day, and everyone loved it. Thanks for the recipe, going into the books! Holy S*#! … this was one of the best recipes I’ve ever had for white chicken chili! Absolutely phenomenal! If I could go higher than five stars I would! Yes, just make sure to cool it completely before refrigerating, then heat it back up thoroughly. I have made this multiple times and it is a family favorite! I add fresh Serrano peppers to cook in and top with fresh jalapeños, avocado, cheese, and chips. Even my two year old asks for seconds. Thank you for the wonderful recipe. Very yummy! I made it with 2 lbs of chicken to make it more macro friendly. I also used greek yogurt instead of cream cheese. Not as creamy but still yummy! Thank you for sharing this recipe. Hi. I mistakenly put the 1/2 & 1/2 and cream cheese at the beginning instead of waiting. Is it ruined? I haven’t tested the recipe that way, but it could work out okay. It really all depends on how hot your crockpot’s “low” is. There’s a change the dairy could curdle if it’s cooks at a higher temperature. I made this for the first time today and it has been cooking for 8 hours and is still very liquidy. How do I thicken it up? It smells delicious and can’t wait any longer to eat it!!! This chili is supposed to be a little on the thinner side, but you could add some cornstarch to a bit of water, stir it until the cornstarch dissolves and stir that mixture into the crockpot. Keep the crockpot on HIGH and stir it often. Have made this multiple times and it’s always so good! Made this and it’s amazing 😉 I’m now on a Keto diet… does anyone know how to “ketofy” this? I’m a beginner on this! I just made it admin is but left out the beans. You can add cauliflower rice or radishes instead of beans. Hi! Would you happen to know how I would make this an insta pot? I have made this recipe a bunch of times and love it but most of the time I always crave it and dont have any of the ingrediants to start it before work. Thanks! Help… My husband decided to ‘help’ me and added way too much chicken broth! I double the recipe but he added three containers of chicken broth!! It is way way way too soupy…. Anything ideas? I hate to waste all of this! Thank you so much for this recipe! I absolutely love it. My family loves it and my friends all request this soup when they come over. I love to chunk up avocados and dump in my bowl (because the kiddos don’t like them that much) and my friends add a ton of cheese and dip chips into it like nachos. Anyways, thought I’d stop and thank you before I make this again tonight! A friend made this and it is absolutely FANTASTIC. I’m seriously putting this recipe into rotation. We’re on weight watchers and this is extremely point friendly. I’m sure I’ll try using fat free cream cheese and half and half, but I doubt it’ll taste as good or be worth the few saved points. 10/10 !! How many points did you calculate for this? I haven’t tested the recipe using dried beans, so I really can’t say for certain. I would assume you could, as long as you soaked them at least overnight before using them in this recipe. Can I use white navy beans? I have made this exact recipe from you multiple times. Im wanting to do it in the instant pot. Do you know if it will work? I use a pressure cooker to make mine and on a 30 minute setting, with the exact ingredients listed here, and it comes out perfect. Just as if I cooked it for 8 slow hrs. I made this for my family tonight and they LOVED it. I like spicy but this has a kick to it for sure. I toned it down w/ a little more cream cheese and an extra splash of the half and half. Maybe I’m a weeny but do what the recipe says because it’s A. Great and B. You can weaken the spicy-ness if it’s too hot w/ extra dairy! I made this today and it was a huge hit! My husband commented that he would prefer if I reduced the amount of chicken broth a little bit so I will try that next time. The flavor is amazing and the toppings were a great addition. I will definitely be saving this recipe to make it many more times. It was superb! I changed a few things. All you who are watching their diet are going to die. I used one whole package of cream cheese, regular. The chili was much thicker and I preferred that. I had a group over for lunch and there was not a morsel left in their bowls! They loved it! I will do it again, with the toppings, blue chips, and avocado dip, and cornbread. I also used a rotisserie chicken from Costco. What a hit! I was thinking about using a rotisserie chicken! Do you shorten the cooking time? I made this stovetop instead of crockpot following the directions listed in comments below. It took longer, closer to 80 minutes total, but my chicken was frozen and i also added veggies (zuchini, celery, bell peppers and carrots, in addition to the onion and garlic). It turned out really well and everyone loved it. Definitely a keeper! Anyone happen to know the calories per serving for this recipe? Approximately 155 calories per serving. But all nutritional information provided is an estimate. I make this often as it is a family favorite. It freezes fine! I reheat in a pot not the microwave. My family LOVED this and it was so easy to make! I followed the recipe exactly. I messed up and added to much broth so my family thought I made a soup! Lol! But it was delicious! I’m making again this week and hopefully measuring the broth correctly! Thank you for sharing your recipe! Made my crockpot right now. I decide to sub Greek yogurt for the cream cheese to cut a little fat and it was still creamy and delicious. How did the yogurt substitute taste? Any weirdness at all? I’m trying this out with yogurt tomorrow… Any suggestions are welcome! Made this for the 1st time & it was a success. My husband absolutely loved it. I followed the recipe almost as written. The only thing I didn’t exactly measure all of the spices as written. I will definitely make this again. How would you convert this to a stove top recipe? I haven’t officially tested this, but I’m sure it will work well. Add all ingredients up to cream cheese and half and half to a large stockpot or whatever you usually cook soup in. Stir well and bring to a boil, then reduce heat to a simmer. Partially cover the pan with the lid and simmer for about 25-35 minutes, or until the chili is thickened to your liking. Add in half and half and cream cheese, stir well and let simmer a few minutes. Stir, then serve as per the recipe. Ground chicken or turkey is AMAZING in this recipe! Thank you for posting this. I was reading the comments specifically to see if anyone had done it with turkey. I make this a lot in the winter. It is SO good! I make this and it’s great, but I add a can of Rotel tomatoes, a can of cream of mushroom soup, and the whole 8 ozs. Of cream cheese! My family loves it! Made this twice already!! This recipe is amazing! I used it for a chili contest and am making it tonight again. It was a hit with my husband. I love how quick and easy it was. I did put a tad more salt and I liked it this way. Made this last night but with a couple changes. First I used 4 big cans of Swanson’s canned chicken. Put on bottom and seasoned it like the recipe says. Using the canned chicken cut cooking time in half. And trust me, it tasted amazing! Second, I omitted the corn and cilantro. Third, I used 6 cans of beans. 2 of those cans I made into a paste with my food processor and dumped that in with everything. It really helped thicken things up. I put it on low for 4 hours then added cream cheese/half and half, put on warm setting for 15 mins then dinner was served. Best white chicken chili I’ve ever tasted! This looks so good and I want to make this tomorrow night! Can you tell me on the spice level how spicy it is? I have 2 small kiddos that don’t handle a lot of spice well. Is there a way to tone down the spice after it cooks or should I cut down the amount of spices I add while cooking? This is so good! I’m wondering if you or anyone has try this recipe with pheasant? You could, but in my experience canned chicken has a distinctive flavor that isn’t present in the original recipe. I use canned chicken every time I make this. We love it! At the beginning, do you cut up the breasts in pieces or leave them whole? Nothing was said about this, so it sounds like you put them into the crockpot whole. 8 hours on even low for skinless/boneless breast, according to my crockpot chicken experience, gives you balsa wood chicken. I cook breasts on low for 5-5 1/2 hours & they’re perfect, but I check them at 4 1/2 hours. I leave them whole, and as they’re cooking in liquid, they do not dry out or get tough. What size crockpot does this require? I would use one 6 quarts or larger. Made this tonight and it was delicious!!! My husband accused me of getting it from a restaurant and trying to pass it off as my own. :). Looking forward to trying some of your other recipes. Thanks for your sharing! Made this for my work chili cook off and it won!!! Very good! Thanks for the recipe!! There’s a bright green box in the upper left-hand corner of the recipe box that says how many servings are in each recipe (6 servings for this recipe). I made this chili and it was a hit with the family! Great recipe! Can you add the cream cheese and half and half and then keep it on warm for several hours or would it be better to keep it on warm and the add the cream cheese and half and half right before serving? Can you use sour cream instead of cream cheese to make it creamy? Can I make this without the half and half? I really don’t want to make a grocery store run. Hello!! I def made this before and it was delicious! So thanks! But, I have a question this time.. I am using chicken tenderloins instead of breasts (still a little over 1lb) How would this vary as far as time? Considering that the tenders are much thinner. If doubling this recipe, would it still cook in 8 hours on low? I haven’t specifically tested it, but I think you might need to add an hour or so to the cook time. Unless you have a really large crockpot, you might want to cook it in two separate crockpots (in which case, the original 8 hours on low would be fine). There’s a bright green box in the upper left-hand corner of the recipe box that says how many servings each recipe makes (this recipe makes 6 servings). How much is a serving? Roughly how many ounces? I don’t measure it exactly, but it’s whatever is 1/6 of the crockpot full. I would estimate around 1 1/2 – 2 cups. Hi. I’ve made this before in the crock pot, but now I have an instant pot and would like to try making it that way. How would I do so? You can add parsley instead of cilantro, but as far as the green chiles are concerned, I’m not sure what a good substitute would be. Does he like jalapeno? You could use some jalapeno in place of the chiles if he likes it. Excellent! And so easy to dump in the crockpot and hours later have an excellent meal. This is one of the greatest crockpot recipes ever! Made this twice–once for my family (2 teens) and once for a church dinner–rave reviews all around. Nothing beats putting this together when leaving home at 7am and returning at 3:30 with dinner ready! This is very watery and more like a soup. How can you thicken the sauce? Traditionally, white chicken chili is thinner than regular chili. You can whisk some cornstarch into the half and half before adding it. Amazing Recipe!! Won 1st place in our work Chili Cook off!😍 I doubled the recipe, but you won’t need to double the broth. I probably added 32 oz of broth. Added extra cayenne for some heat. I also used three cans of green chilies and one serrano pepper seeded. A few friends have made, and really loved it, thank you for sharing. I absolutely love this recipe. It’s easy and simply delicious. I’ve made it twice in one week. How can I make this without the crockpot? I have cooked rotisserie chicken I’m using and not enough time for the crockpot. I haven’t officially tested this, but I’m sure it will work well. Add all ingredients up to cream cheese and half and half to a large stockpot or whatever you usually cook soup in (substituting a few cups of shredded rotisserie chicken for the raw chicken breasts). Stir well and bring to a boil, then reduce heat to a simmer. Partially cover the pan with the lid and simmer for about 25-35 minutes, or until the chili is thickened to your liking. Add in half and half and cream cheese, stir well and let simmer a few minutes. Stir, then serve as per the recipe. Best white chili I’ve ever had or made! Just won my neighborhood’s chili cook off with this recipe! Stuck to the recipe; Doubled all of it except I used 32 oz chicken broth instead of 48 oz. Perfect! Would definitely make again! My fiance & I work really weird times. If I were to cook it on low for 15 hours (basically enough time for one of us to go to work and the other to get home) do you think that be okay? At the end of the 15 hours we would shred the chicken & cook on high for 15 minutes. Since it is chicken, it makes me nervous. Michaela, you could buy a roasted chicken, shred it and add it to your crockpot later then you don’t have to worry about the chicken texture being off. Or you could make this when you guys are in bed and cook on low overnight and be ready in the morning….good luck! Any ideas if this will freeze okay? I haven’t tried it, because I’ve had bad luck with freezing soups with dairy in them. I did freeze some of this in individual, 1 serve containers for food prep lunches. It held up very well in the freezer. I did use them up within a month, so not sure about long term freezing? Hope this helps. This is hands down my new favorite soup! This recipe is delicious!! I did change a few things thing though. First I doubled everything. Second I did not use half and half, I substituted it for a couple spoonful’s of low fat sour cream. I also used the lowest of fat cream cheese I could find. I did not put in cilantro or corn. I substituted the corn for hominy. I also used the cheaper “grocery store” branded items instead of name brand. I cooked it low and slow for 8 hours in my crock pot, took the chicken out to shred (it basically shredded itself) and put it back in the pot and added the cream cheese. Perfect! Could I use ground chicken instead? I haven’t tested the recipe that way, so I can’t say for certain. This recipe tastes amazing! So easy! Definitely make this! 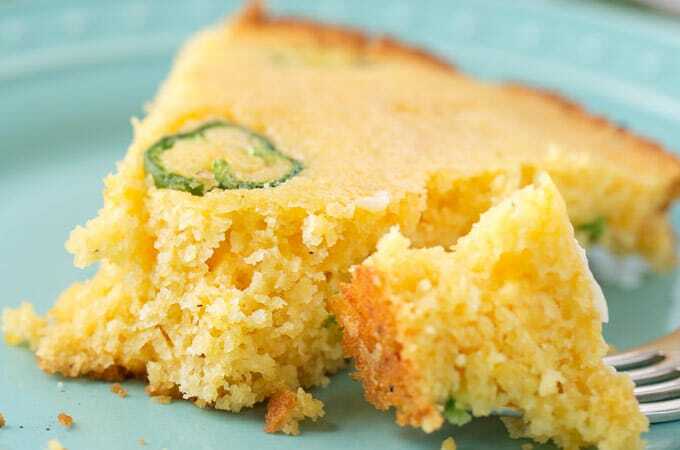 I made it with your jalapeño skillet cornbread recipe which was also amazing! My husband loved them both! I’m not a cook, so this is a stupid question, but do I put frozen chicken in? or thawed? No such thing as a stupid question 😉 Thawed works best for this recipe. I won the church Chili Cookoff tonight with your recipe! Thanks! It was delicious. I did swap out the raw chicken with a rotisserie chicken which added a little more flavor to the chicken. I’d use a bit less broth next time also as I like it thicker. But it won! Thanks! Did you double up t serve a large amount of people? I have an office chili cook-off for about 20 people. I just wanted to make sure this could make enough for a couple people. I have a large Crock pot. This was my first time ever making or eating chicken chili and I must say this recipe was absolutely delicious. I was unsure all day of how it would turn out, but myself as well as my hubby and children were very pleased. The only thing I did differently was added an extra can of beans. Will definitely be making again! I’ve never measured the exact volume, but it’s 6 decent-sized servings. I made this in my instant pot yesterday and it is amazing – thank you! One of the best soups I’ve ever had! I sautéed the onions, added the spices, then the broth, chilies, and chicken (I doubled the chicken). Covered and set to pressure cook for 12 minutes, natural release for 10 minutes. Take the chicken out to shred. I doubled the cream cheese, beans, and corn and stirred those in. I also added a cup of frozen chopped kale. When I put the chicken back in I also needed to add a cup or two more of broth. Perfection! I made this today and it was delicious. My husband really liked it. How do you think it’ll reheat? I’ve found it reheats very well! If you double this recipe, could it all fit in a 7 quart crockpot? I think that would be a little too full… I would say you’d need at least an 8 quart. I want to try this, but no one in my family likes beans. what if I leave them out? would that be OK?? Maybe I’ll add extra chicken? I’ve never tested the recipe that way, but I think it would be okay. I’d add some extra chicken though. You could pulse the beans lightly in a food processor before adding or use an immersion blender (at the end or with the chicken broth before adding it to the crockpot if you don’t want to blend everything) to break them down – this way your family might not even notice they’re in there! I do this with regular chili to sneak in foods my family doesn’t like the texture of, works like a charm! Have fun with this recipe! But i highly recommend. I am finishing this up now. It taste great, but seems a little thin. Is there anything I can add to thicken it? You can mix some cornstarch in a bit of milk and stir it into the chili… traditionally, white chicken chili isn’t as thick as regular beef/bean chili. I made this recipe exactly as written. Delicious!! Hi, this recipe sounds delicious but I’d like to leave out the half and half and cream cheese if possible. Do you have any suggestions for that? Maybe to add cream of chicken and a splash of milk or some flour? Thanks! Hi Bridget, I’ve only tested the recipe as written, so I can’t say for certain how that would work out. I don’t think the cream of chicken would work out well. I didn’t use the half and half in mine today only the cream cheese. I bet it would still be tasty still without any dairy product added. This recipe was amazing as is!! I added a bit more half and half because, why not. I actually won my office’s chili cook-off with this!! Thank you! I’m making this tonight for dinner. I couldn’t find canned green chilies, I used chipotle instead so we might have pink chilli . Smells delicious; can’t wait! Can I use a chili seasoning packet since I don’t have chili powder or cayenne? I’ve never tested the recipe with a packet, so I can’t say for sure. OMG… I made this last night on the stove (crock pot broke) and it was soo good! Next time I will do one hot and one mild green chilli, I only did 2 medium I was afraid of the spiciness with my stepson. Everyone loved it (even the picky teens), and came back for seconds. Do you think it would be just as good with Ground chicken instead of chicken breast? I have that on hand in the freezer. Hi Dana, I’ve never tested this recipe with ground chicken, so I can’t say for certain. If you try it, I’d brown the chicken first in a pan. Quick question. I made a recipe very similar to this years ago and it was my favorite meal ever, but it had rotel, black beans and ranch packets in it. 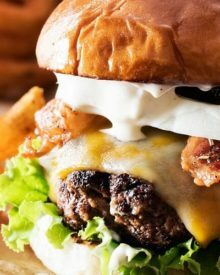 I was thinking about staying with this recipe but adding the ranch, do you think that would taste alright? Hi Stephany 🙂 I’ve never tried it with ranch seasoning, so I can’t say for certain… but I *think* it would be okay. Hi! Do you know what the calorie count is? Protein, fat, sugars? Thanks! I have tried the recipe the way it was written turned out great couldn’t get my kids to eat it until I added one medium russet potato and a handful of bacon to the recipe and i still have no leftovers whether it’s the modified one or with a little company the original recipe. I was hoping there was a way to make this in a pressure cooker instead of the crock pot for the days I don’t have that long to cook it in the slow cooker??? Hi Shawnda, how did it work for you in the pressure cooker? I am thinking about making this for dinner tomorrow and would prefer the pressure over slow cooker if this worked for you. My husband (who hates to cook) made this for dinner last night after I sent him the recipe! It was delicious, even my kids liked it! I left out the onion because I forgot to get one at the store, and it was still amazing! 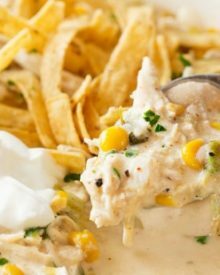 Can I make and freeze white chicken chili? I’d like to make it in advance, freeze and reheat at the tailgate party. My husband doesn’t like beans, do you think it’s okay to cut out the beans and add more chicken? I made this for my kids and they don’t like beans , I puréed them with an immersion blender and it came out great. Thickens it as well. Would you recommend freezing this? Very good recipe with all the toppings! How many does this recipe serve. Need a quick answer. Is there any way to make this if I dont own a slow cooker? Absolutely! Saute the onion and garlic, then add everything except the cream cheese and half and half. Simmer for 20-30 minutes, or until chicken is cooked through. Remove chicken and shred, then add back to the pot. Add cream cheese and half and half, and cook for 5-10 minutes. I just made this recipe for our church lunch chili cook off. It was delicious. I doubled the recipe but added less broth. I also added 2 cans of cream of chicken soup and about a cup of shredded monterrey jack cheese. Creamy and cheesey! It’s delicious! Second time making this recipe! This time though, I’m running a bit short on time, do you think 6 hours on low in the crockpot would still be ok? Hi Mel 🙂 I think that should be just fine! I made this yesterday in my 6 1/2 quart slow cooker and the taste was even better than I was expecting! I used closer to 2 lbs of chicken and added more cumin and chili powder to compensate. I cut out the corn since I just have a weird aversion to corn added to soups and chowders. I also only used 16 oz of chicken broth. There was a lot of liquid even with reducing the broth, so I’m glad I cut out a cup. I did add some flour to the half-and-half to try to thicken it, so I imagine the leftovers will be nice and thick. I will definitely be making this often! What is the serving size? Is it 1 cup or 1 and 1/2 cups? I couldn’t find anywhere on your recipe. The recipe comfortably feeds 6 people. I don’t precisely measure serving sizes, so it’s just 1/6th of the crockpot full of soup. I just made this In My 6 qt IP AND IT FIT! I haven’t tried, but since there’s dairy in the finished product, I would only freeze it under the following condition. Make the soup up through step 4 (soup is cooked, chicken is shredded). Cool completely and freeze. Thaw overnight in the refrigerator, and when heating up, add the cream cheese and half and half. That way the dairy isn’t negatively effected. I accidentally put the half and half and cream cheese in with everything else. I don’t have time to wait 6-7 hours on low, so I have to cook it on high. Do you think it’ll still turn out? I’ve never tested the recipe other than as written… and with cooking on high, there’s a risk the dairy could curdle. It might be okay, there’s no way to tell, especially since all slow cookers cook at different temperatures. Do you have the nutrition facts for the recipe? I saw the calorie count, but I am looking for all the facts. Hi Lindsay 🙂 I don’t provide full nutritional information for my recipes, as I’m not a nutritionist and don’t want to inadvertently pass out false information. I recommend copying the ingredient list into whatever online nutrition calculator you use and trust. I just put into My Fitness Pal, and mine calculated 425 calories per serving (figured 6 servings) but I used 1.75 lb chicken breast to up the protein! I added the cream cheese and half and half with all of the other ingredients. Do you think this will still turn out? Hi June, I never tested the recipe this way, but if you’re cooking it on LOW, it should be alright. The concern with cooking it at a higher temperature is that the dairy could curdle. Can you cook the chicken a bit in water before putting all the ingredients in the slow cooker? Just trying to cut down cooking time a bit, thanks! Yes, you could poach the chicken first, or even use a shredded rotisserie chicken! How long do you cook using rotisserie chicken ? Hi there Chef Amanda! I have been trying to make good biscuits forever – and like you said the taste was good but they just weren’t fluffy! I can’t wait to try your recipe! As I looked thru your recipes I noticed your White Chicken Chili & had to check it out. I make a version almost identical but it calls for hominy in place of the corn. I have never been a hominy fan in the past, but girl I have to tell you it is fantastic in this soup! Thanks for the recipes and the inspiration!!! How many does this original recipe serve? I need to make this for 14 people and need to know if I need to double or triple it. I would double it, as it makes 6-7 servings as is. Unless you have a HUGE crockpot, you’ll want to make it in 2 separate ones though. Made this tonight for dinner. It was so good! Only thing I changed is I put at least 2 lbs of chicken in it and a little more cream cheese and half and half. It was wonderful! So delicious! I made this for the first time for my family last night. I had everything but the chiles. After my husband ate it he said “you know, it’s really good but next time maybe add a can or two of chiles” 😁 so next time I’ll make sure I have chiles. Turned out amazing! I changed it slightly – added two more cans of beans and used Mexicorn. Also threw in a can of cream of chicken soup (probably didn’t need it). Was a huge hit for Monday Night Football! This recipe is perfect ! I usually do one can of northern beans and one can of pinto beans instead (i just love pintos haha) And I add a little extra seasoning (I love some spice). But this soup with some Mexican cornbread is perfect! Everyone always loves it! I followed this recipe exactly as it is written and it turned out SO good. My husband and kids and I loved it! Thank you so much for this recipe. I’ve been trying to find a good white chicken chili recipe for years. Is the chicken cooked or thawed before it goes in the crock pot? 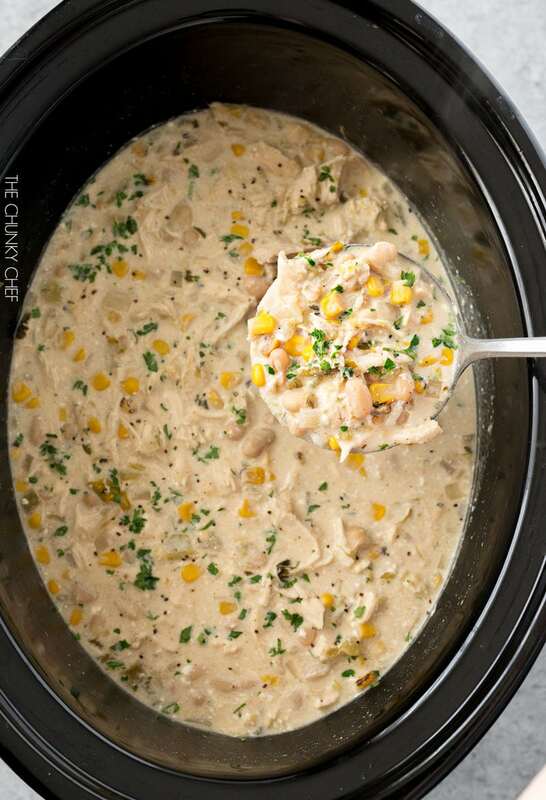 I have done lots of crockpot recipes with frozen chicken, works just fine, just do low for 7-8 hours or high for 3-4 hours. Sooo good and easy too! I used a rotisserie chicken to make it even easier. My picky eater even finished his bowl. Thanks! This chili is soooo delicious!! It’s Mid-July and here I am making this recipe and it is seriously delicious. Love it. This was absolutely delicious and so easy to prepare…you can pretty much have everything on hand at anytime (aside from the avocado). Some of us ate this over brown rice in a bowl and others turned it into a burrito! It got thumbs up all around, kids included! Seems like the leftovers will freeze well! Thank you for a great and easy recipe. A WHOLE ONION seems like a lot. Or am I just worried? AH MAZING! We eat this at least once every other week, no matter how hot it is outside. It is so good!!! Reduced the stock to 16 oz. Used whipped cream cheese (I just could never get the block cream cheese to fully dissolve). Added a little corn starch slurry at the end and let thicken for about 15 minutes. My husband likes his chili thick and this did the trick. We also add crumbled queso freso to the final product. This chili really sticks to your ribs and we have tons of leftover! This was fantastic. I was looking for a different take on my classic chili recipe and immediately became interested in this recipe. It did not disappoint. Full of flavor and very tasty without feeling it when you step on the scale the next day. I know this was posted a long time ago but definitely wanted to comment. The only con was that there was not enough left for seconds. Everyone loved it! Can you double this recipe using the same crock pot? Hi Joy 🙂 I would say if your crockpot is a 6 or 7 quart, it might be too small to double it. Maybe you can borrow a crockpot from a friend and have a batch in each one? Made this for dinner tonight DELICIOUS. Will definitely make this again. This recipe was SO good and super easy! Everyone loved it! So i decided to try to make it found your recipe and followed the recipe to the T.
has anyone used ground chicken breast in this recipe ? I just bought some on sale! I made it overnight and finished up today! It is Delicious! I seasoned 3 chicken breast with all the seasonings and still added the recommended recipe amout. I also used heavy cream. I will definitely make this again!! I made this a few times pretty well keeping to the recipe, only making sure to use as many no salt added ingredients as possible, and exchanging the salt for a few shakes of garlic salt. This time I beefed up the paprika, cumin, and garlic to give a stronger flavor. I also added a little lime flavored yogurt for a tiny bit of bright tartness… it must have worked because I just won our chili cook-off at work! Thank you for coming up with such a good recipe! One thing I’ve found to save a little time: the chicken does not need to be removed from the slow cooker to be shredded. It’s plenty fall-apart-y after cooking all day to just shred itself when stirred! Made this tonight for dinner. Whole family gave it a big thumbs up! Will definitely be making this again. Thanks so much for sharing! This is a family favorite! Very delicious, and has been integrated into the routine menu at our home. Love the creaminess. I have made this with both the crock pot, but also on the stove. Thank you for this recipe! I won 1st place in a chili cook-off with this recipe. I did tweek it a little bit. I I began with one chopped purple onion 2 cans of white beans and a can of corn. Added one can of diced green chili’s and a jar of salsa verde. Then I added a can of diced tomatoes. Cubed 4 chicken breasts and sprinkled the seasonings on the top. Poured 12 oz of broth over the pot. Slow cooked all day and melted cream cheese in a pan before adding it in at the end. Topped with the cilantro, cheese, jalapeno, sour cream, and served with tortilla chips= Award winning white chili. Best White Bean Chicken Chili recipe I have tried!! Thank you for sharing! We love this recipe! This is our second time making it and it is delicious. So much flavor and it’s not too haeavy. Thanks for sharing!! I can’t wait to try this tomorrow! Do you add in the whole cans of chiles? Or drain them first? Thanks! I usually drain them first 🙂 Hope you love it! I see that the servings is for 6 but what is a serving size please? Omg Delic. I made it and topped with Avacado, cilantro, and cheese!! This is AMAZING!!! Thanks for sharing your recipe!! Made this tonight and was very good. I think the next time I will use heavy whipping cream instead of half and half. Topped with cheese, cilantro, and a small amount of sour cream and then topped with corn tortillas. Thank you for sharing!! This is the 5th time I’ve made this in the last 2 months! Was a big hit for 2 Christmas parties with several recipe requests. I make mine a little hotter and use frozen corn, otherwise just as written. I have 2 crockpots going now to freeze some. Think I’ll freeze some with cream cheese and milk and some without until I reheat as suggested. Love to make regular chili, Brunswick stew, and now this to have ready meals through the winter. This is my new, favorite recipe, thanks so much for sharing!! Hey Debbie! Can you comment on how the chili that you made completely and froze turned out once you thawed it? Thank you! Made this chili last weekend and will definitely make it again!! Great flavor and easy to make. I pinned this recipe some ago, but came across it this COLD and snowy day here in Appalachia, plus I had everything on hand! No need to plow out for special ingredients. This soup was very good; tasty and creamy. Full disclosure: I only had 1 can of green chilies, so added 1 diced jalapeño and added about 1 cup shredded cheddar/colby blend. Really good. My husband and I are “mostly” retired, so we don’t have the time constraints facing most young families. Next time I probably won’t use slow cooker. May used shredded rotisserie chicken, as that’s usually in the freezer, cook onions & garlic, then pull the rest together in about an hour. So was a cold winter’s night and my daughter had her wisdom teeth out a week ago! This was the perfect soup! Will definitely make again as everyone liked it and it really was delicious! My first crack at white chicken chili, I always had this thought….chicken in chili???!!! But, I am sold now!! I made this tonight for dinner and cooked on stovetop rather than crockpot because I found this recipe today at work so didn’t have the chance to cook in crockpot but nevertheless it was amazing even if it was cooked on stovetop. I had forgotten to pick up the Half & Half so I substituted 1 Tbsp butter(melted) and 3/4cup of milk. This is DEFINITELY 🌟🌟🌟🌟🌟!! Thanks for the recipe and I would highly recommend trying it out!! I will def be saving this one!! This was a hit with my family. Will do again !! This is so good and easy! I’m on the weight watchers freestyle program and this is only 3 points per serving. My family loved it. I used regular cream cheese but 3 oz instead of 4. Great recipe! Loved this recipe mainly because the spice level was perfect! I used mild chopped green chiles and was glad. I did read some of the comments about the thickness and used some corn starch and 8 ounces of cream cheese. It was soooo good. My husband told me to stick to this recipe always. Any idea how many ww points this would be? Instead of making this in the crock pot, could you make it in a soup pot on the stove as well? I have pre-cooked chicken in the freezer that I plan to use, so I’m thinking I could just combine all of the ingredients and cook it on the stove for an hour or so. Hi Emily 🙂 Yes, you can definitely do that. I would start out by sautéing the onions in the pot, just to make sure they soften, then add the rest of the ingredients (except the half and half and cream cheese). Cook that for about 20 minutes or so, then add in the cream cheese and half and half and cook that, stirring often to mix it well, for about 10-15 minutes. This recipe is fantastic and one we have several times throughout the whole year! I don’t own a slow cooker but I really want to make this. Saw this on my Instagram and instantly wanted to try this recipe. Is there any other way to make this that does not involve a slow cooker?? Add all ingredients up to, but not including, cream cheese and half and half to a large stockpot or whatever you usually cook soup in. Stir well and bring to a boil, then reduce heat to a simmer. Partially cover the pan with the lid and simmer for about 30-40 minutes, or until the chicken is cooked through and the chili is thickened to your liking. Remove chicken to a bowl to shred, then add it back to the pot. Add in half and half and cream cheese, stir well and let simmer a few minutes. Stir, then serve as per the recipe. Do you know if anyone has tried this using the Instant Pot? I was looking for recommendations on cooking times with the instant pot. Thank you! I’ll post later if I figure it out. I am going to try it tonight…however I am very new to my instant pot…. how did the instapot version turn out? thinking of making for a crowd next weekend. I too am new to the instapot and very curious 🙂 can you share what you did / learned? Loved this recipe! The broth actually had a lot of flavor before I even added the cream cheese and half & half. It had so much flavor, I could almost cut the cream cheese and cream in half. Great easy recipe and good freeze away for later dish! I love this recipe! How much is considered a serving size? a cup, a cup and a half? I’m entering this recipe into my weight watchers recipe trackers! Hardly any points at all 🙂 Can’t wait to make it this weekend! Hi Maggie 🙂 I never really measured it, but I would say about a cup and a half is a serving size. Hope you love it!! Happy Holidays to you as well! Hello! Absolutely love this recipe because of how easy it is and how the simplicity doesn’t take away from the amazing flavor! ? With that being said, it is ok if I video blog using this recipe and of course let everyone know TheChunkyChef.com was responsible for this beautiful creation? Thank you for posting this recipe! I made this last night, and it turned out really good. I would note, like other posters, that this is more of a watery chili – if that’s not your style, I would recommend using about 1/2 to 3/4 the recommended broth. I didn’t mind personally as I do like mine a bit more on the watery side. 🙂 I did follow the recipe exactly as suggested. This only filled my crockpot about 1/2 to 3/4 the way full. I would recommend doubling the recipe. The nutrition facts say 50.3g of carbs. Is this a typo? Or is that for the entire crockpot of chili? Hi Kristi 🙂 No, not a typo… that’s what the nutritional calculator said. The beans and corn add a lot of carbs to this dish. I am making it today? Okay, we just finished dinner and I got the “This is delicious!” from my partner which is only said when she truly loves something. Then she exclaimed “winner winner white chili chicken dinner”! So trust me, that is a HUGE compliment. Anything involving corn is usually a win for her, but this was a super successful hit. I also made the skillet cornbread, more sweet without heat or cheddar, just plain corn bread. It is perfect. 23 minutes in the oven, a perfect golden brown on sides and bottom, great flavour. It is a bit “crumby” and can’t be handled much, but that’s not a problem. These 2 recipes together are a home run, for sure. This is my first time cooking with your recipes and I am now very eager to try more when I’m feeling bored with my own recipes. Thanks so much! I rarely follow recipes. I try sometimes but I just can’t make myself do it. But I decided that this one sounded so good that I would try to follow the recipe. I did pretty well. The only thing I did different was at a little more cumin, because I just really like the flavor of cumin, and I added a can of tomatoes, because I love tomatoes in chili whether it’s white chicken chili or what ever. I did not make it in the slow cooker I just did it on the stove and I used a rotisserie chicken. It was absolutely the best White chicken chili I have ever had. I save the recipe so that I can make it again which is another thing I never do. The first time I made it was about a year ago, and I just pulled it out to make again and this time I am doing it in the crockpot with raw chicken, so I’ll see which way I like it better. I absolutely love the garnishes. The crispy tortilla chips the avocado the lime in the sour cream, all of it is absolutely delicious. Sooooooo freaking good! I made it with jalapeño cheddar cornbread muffins. Will definitely make again! My hubby and I loved this recipe. I wouldn’t change a thing. Thank you chunkychef. This chili is delicious and easy to put together!! Followed the recipe except did not have can of hot peppers so used can of mild and two diced, fresh jalepenos. Will say the flavor profile was on point between the spicy kick, sweet corn balance and creamy, tangy broth. Was declared a winner from every member of the family so now going into the rotation. Have shared this with others too. So glad this popped up on my Pinterest feed!! Thank you! Was going to make this until I saw the sodium content. Definitely not for people on sodium restricted diets! Not sure why you felt you had to give a low rating to a meal you NEVER cooked. Pretty sad you felt the need to do so & add your comment, when you can obviously substitute low sodium ingredients. This is a great go-to recipe that is easy, delicious, & VERY tolerant to substitutes! Have a wonderful day! ? Hi, I have this in my slow cooker right now. It smells so good. Can’t wait to try it. Thanks for the recipe. Super delicious!! Everyone in the house loved it, even the picky kids. Hi I wanted to make this tomorrow night but I don’t eat meat, has anyone tried making it without chicken, and subbing the chicken brother for vegetable broth? I had never tried white chicken chili until I tried this recipe, and I won’t be trying any others! I’ve made it half a dozen times now, and it’s alwags a hit. I just started Weight Watchers, so this was the first time I tried 1/3 less fat cream cheese and fat free half and half, but it was still excellent! One serving is 10 smart points with those changes. I loved this recipe. It’s great cooked in a pot on top of the stove too. I used rotisserie chicken already cooked and added the seasonings and broth, let simmer for 40 minutes to an hr then add cream cheese and half and half. Topped with pepper jack cheese, avocados, sour cream and lime Tostitos… it was out of this world!!! I had a kitchen disaster trying to do this on stove top where I burnt the chicken to a crisp, nearly ruined an expensive pot and my house still reeks of burnt cumin. I used raw chicken breast and my intention was to poach it and pull it. I had it on low simmering and it went from great to kitchen disaster very quickly. I tried the 2nd time in the crockpot and it was perfect! No drama, no burnt stench for days and no massive clean up production! Have you ever used boneless skinless thighs? I have a vouple pkgs to use and wonder if theyll be just as good. Hi Jen 🙂 I haven’t tried it, but I think they should be just as good! Is this spicy ? Would I use only mild chillies if I can’t handle too spicy ? Hi Nicole 🙂 I don’t find it too spicy, but if you’re worried, I’d use mild chiles and cut back a little on the cayenne. First time ever making this and it was super easy and tasted great! As my very picky eater put it “it was bomb!” So its definitely on my list to make again. Only change I made was I used heavy cream in place of half & half and regular cream cheese. I used half milk half cream plus half stick butter n some cornstarch to thicken it up a little. Was great! I made this saturday…..phenominal….only 1 bowl left for me…..going to make again and frreze in bowl portions. So so good and super easy! When you calculated the servings did they come to about a cup? I’m trying to calculate with my WW points. Hi Julia 🙂 I’ve never measured it precisely, but it’s probably more like 1 1/2 cups or so per serving. Hi this recipe looks so yummy but I don’t like spicy things. I like flavor but not ‘hot’. If I were to leave out the green chiles would it lower the spicy factor? Hi Nicole 🙂 We don’t like things too spicy here either… I would reduce the 2 cans of green chiles, down to 1 (and use mild), and omit the cayenne pepper. That way you should still have good flavor, but it shouldn’t be spicy 🙂 The cream cheese and half and half reduce the heat factor a lot as well. Can you use frozen, already cooked chicken like the Tyson chicken cubes chicken? If so, how long in the crock pot?! Thank you in advance! Hi Jana 🙂 I’ve never tried it that way, and only tested the recipe as written, so I can’t really say for sure. Can you substitute the chicken breasts for ground chicken? Hi! I’m getting ready to make your recipe now (can’t wait!) do you use thawed or frozen chicken?! If it’s frozen, how long do I cook it? If it’s thawed how long do I cook it?! Thank you!! Oh My Goodness! Where has this recipe been my whole life! Loved it, will now be a staple in our home, kids liked it too! I had to make some changes due to what was in the cupboard and kids not liking heat. I did not crockpot it, therefore used 2 cups broth. Used ground chicken cooked with the onions seasoned with chili powder, garlic powder, salt and pepper. Omitted chilies and jalapeño for kids, although if making for myself would definitely use. Once ground chicken was done, added the broth and rest of ingredients to simmer 45 min. The thickness was perfect. I halfed the salt because 1 of my 2 cans white kidney beans had salt added. I also used a heaping 1/2 TSP chili powder in the broth wit the othe seasonings listed. Added 2 oz cheddar cheese to the pot rather than serve on side. The fresh avocado slices were great in it. Loved it, thanks for sharing! Typical Wisconsin weather had us celebrating beautiful fall temps in August and I was more than happy to unleash the flannel and put on a pot of chili. I found this recipe yesterday and knew I HAD to make it. While shopping in the produce area for the cilantro I decided to grab a couple Poblano peppers and 3 ears of fresh sweet corn. Roasted the peppers in the oven for a bit, sliced them and used them instead of the can chilis. Sliced the corn off the cob and used it instead of canned. I don’t know if that changed the taste at all but it was scrumptious! Made this tonight in the instant pot. It was delicious. Followed the directions, but instead of putting everything in the crockpot I put it in the IP and used the poultry button forn20 minutes. I used 2 frozen chicken breasts and reduced the chicken broth the 14.5 oz because I knew the frozen chicken would create a lot of liquid. In hind sight I should have reduced it even more. It was a little runny when I finished so I threw 4 more ounces of cream cheese in it. We served it over rice. I’m certain this will become a regular in our meal rotation. Might to black beans and a little Ro-tel next time. Hi there 🙂 I’m so glad that you all loved this chili so much! If I’m needing to make a recipe and a half, in the smaller crockpot do I stay with the 4 hours low/8 hours high or do I need to adjust it? This was very good! A definite make again, I loved the spices, the slow cooker method, really delicious ingredients. I didn’t have any corn and it was still amazing. I loved the garnishes too, especially the tortilla strips. I didn’t have any half and half but it was still creamy with just the cream cheese. Love!!!!! This recipe. Can it be frozen after cooked? I’m leaving meals for my family while out of town and I have never frozen it yet. Hi Lauren 🙂 I never have many leftovers, but I think it could work! Oh, WOW, this was delicious!!! Absolutely loved it without any toppings, just tortilla chips for scooping up this yummy chili! I can tell you, this recipe is forgiving! I dumped it all in the crockpot and hours later shredded the chicken. In tasting, I was a little heavy handed in the seasonings, so I threw in two more cups of water and another can of beans. Cream cheese went in, used fat free half and half (about a cup) with a couple tablespoons of flour mixed in, and let it simmer. Wonderful, wonderful, wonderful!! Hi Sherri 🙂 I’m SO happy to hear that you loved the chili!! Can I used bagged/raw Northern beans? I could not find canned Northern beans? If not, will canned cannelini beans work? Thank you! You made me, my son and my readers really happy with this recipe. Thanks. What is the heavy cream equal substitute (1/2 cup maybe? )… I’m thinking of trying this with shrimp. Any thoughts/ideas on a creamy seafood chili recipe? Could I make this in an Instant Pot? If so, do you know the time difference? Hi Elizabeth 🙂 Unfortunately, I’ve never tested this recipe in an Instant Pot, so I can’t say for certain. 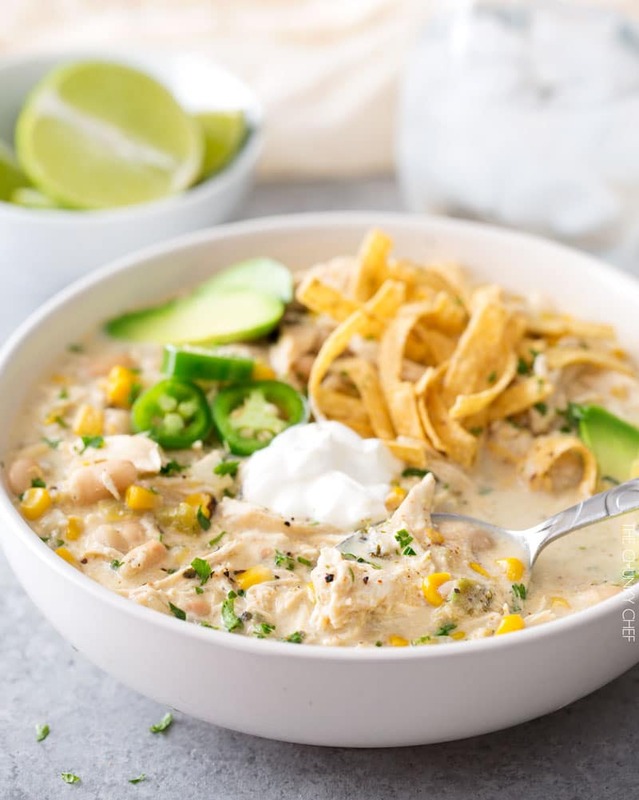 Your best bet would be to find a white chicken chili recipe specifically created for the Instant Pot, then use these ingredients instead of that recipes. Best of luck! When you say “Chicken broth” – is this just made with chicken stock cubes and the recommended amount of water per cube? For example each cube I use says to add 500 ml of water…. Maybe in the states you can buy “Chicken broth” already made? I made it today; delicious! It is so wonderfully different and delicious! My husband loved it, too! Adding this to my favorites!! Hi Carol 🙂 I’m SO happy to hear that you both loved it! I substituted the cans of chilis due to sodium. I used jalapeños, serranos, and let one habenero steep while cooking. Then I used Silk Soy Creamer for the half and half and it worked great. I wondered about the cream cheese but it fit with my numbers and I was so glad it did. NoSalt substitute. All in all it was fantastic. Thank you so much for this inspiration. I couldn’t have done it without you. Hi Clay 🙂 I love your substitutions, they sound fantastic! So happy to hear that you were able to adjust the recipe to work for you and that you enjoyed it! Hi Lyndsay! I haven’t ever doubled it, because like you, my slow cooker is just a standard size and I was worried it all wouldn’t fit. Maybe you could borrow a slow cooker from a friend and have a batch going in each one? Best of luck to you! This was amazing!!! My husband made it tonight for dinner!!! Anyone know what the points are in the Weight Watcher program? Hi Angela 🙂 I’m SO happy to hear that you loved the chili!! Unfortunately I don’t have any experience with the Weight Watchers program, but maybe there’s a place on their website that you can plug the recipe in and it will tell you? This sounds amazing and I can’t wait to make it tonight. Is there a way to do this on the stovetop if I don’t have a slow cooker? Great new recipe for cold winter nights! Thanks! Made this for the first time tonight and and it won’t be the last! My husband said it was the best new recipe ever and I was to get on here and tell you so! I didn’t make any changes it’s amazing- thank you!